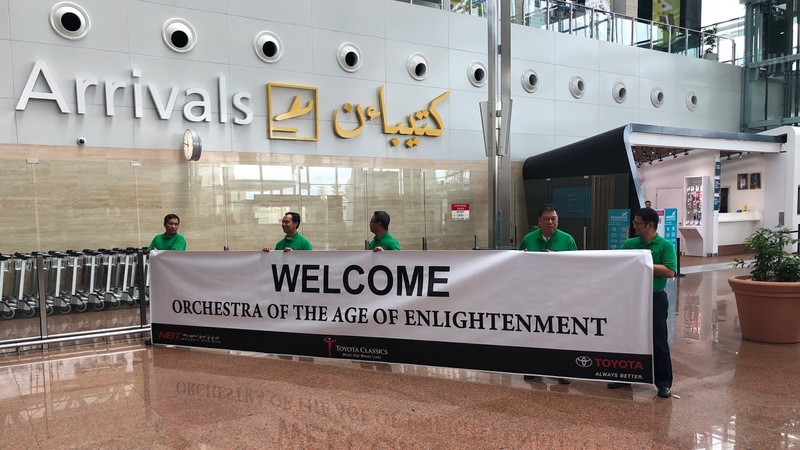 As we entered the arrival hall at Brunei International Airport we received an exceptionally warm welcome. There was a 10-metre wide banner upon which ‘Welcome Orchestra of the Age of Enlightenment’ had been printed, and a whole team of people had come to greet us: taking photographs of the occasion, helping us with our luggage and ushering us in the direction of the coaches that would take us to the hotel. Two coaches took us the 9 kilometres from the airport to the Radisson Hotel in Bandar Seri Begawan. During this short trip, just looking out of the coach windows, incomparable flora and fauna was apparent here. I glanced toward the undergrowth near a roadside drain and I saw a bird the size of a guillemot with similarly bright red legs (but longer). It looked nothing like any bird I had seen before. After much searching I found out that this was a White-breasted Waterhen (Amaurornis phoenicurus), found only in marshes in tropical Asia. Plants and trees were very different here too; with plumes of palms, mangrove forests, and nothing deciduous visible in this evergreen, equatorial environment. We traversed wide highways and passed enormous mosques and other examples of Islamic architecture, often with domes replete in gold leaf. It was baking hot and very humid outside the air-conditioned coaches. This was all quite new to me. Another huge banner greeted us outside the hotel and we checked in to the Radisson after our long journey from London. While checking in, the hotel staff provided us with fruit juice in the lobby. We found a beautiful welcome gift (a commemorative coin with the Sultan of Brunei embossed and engraved on one side) and there was a welcoming letter with an information pack in our rooms. The information pack detailed matters of etiquette for each country we would be visiting. For example, it was important in Brunei to dress modestly, preferring trousers rather than shorts for the gents, and any pointing should be done with the thumb - something that was difficult to remember when there was plenty (of wildlife particularly) to want to point at. Following a swim in the hotel’s pool I ventured out to explore the surrounding area. It was very warm; this would take some getting used to. 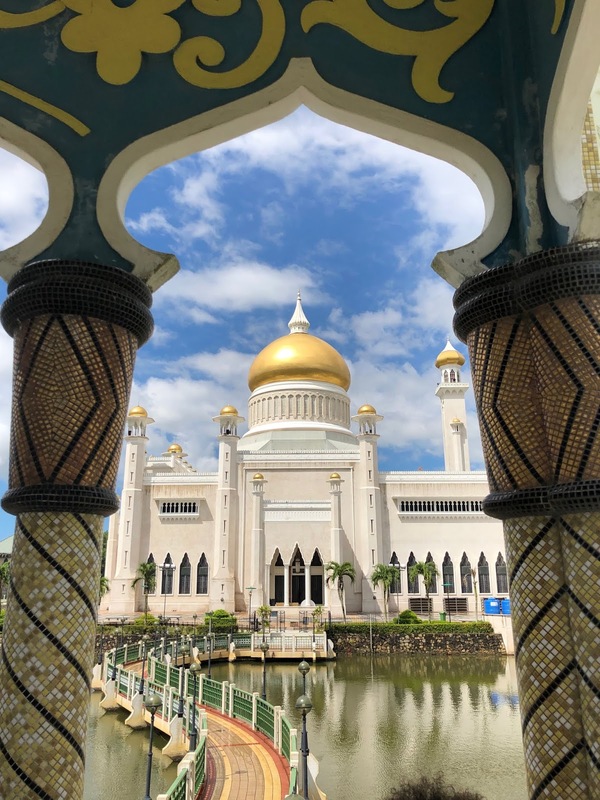 We walked towards the Brunei river and then towards the Omar Ali Saifuddien Mosque, which was framed by a pristine lagoon and a marble bridge leading to a replica of a 16th-century barge (Sultan Bolkiah Mahligai Barge). We explored this area a little but our jet-lagged brains and bodies needed food and rest. My vision felt overexposed in this direct sunlight and I felt a bit dizzy from being jostled on various modes of transport in several timezones. We ate in a nearby shopping centre (Yayasan Sultan Haji Hassanal Bolkiah) and my tired brain chose the least appetising thing on the menu. I struggled on. We stayed in the restaurant for ages while a tropical rainstorm tired itself out. It wouldn’t be the first time we got stranded by rain in Brunei, but at least we were dry. We waited for it to subside and eventually tiptoed to the hotel through enormous puddles. Intense heat, humidity, monsoons and sizeable puddles were probably the main reasons behind the lack of pedestrians here; driving was definitely preferred by the locals, and almost all of the people we saw walking around were part of our tour group! There was one occasion where a local driver wound down the window at a set of traffic lights and insisted that an increasingly drenched individual took their umbrella! 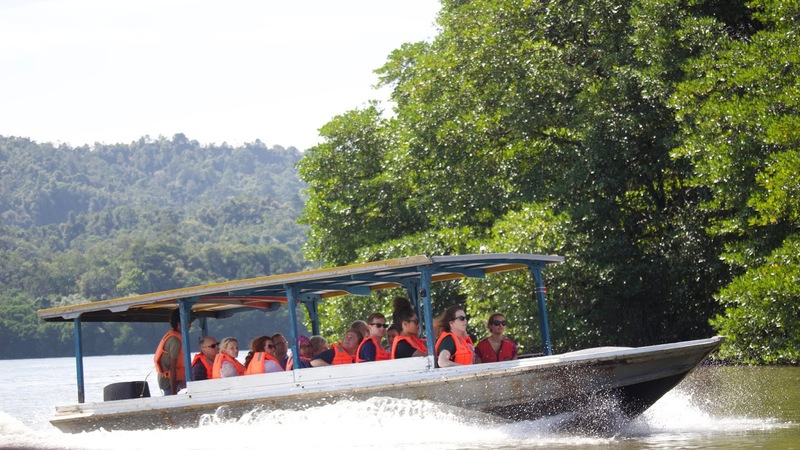 After a much-needed rest and an extraordinary breakfast (with everything from bread and butter pudding to tarka daal available) the vast majority of the orchestra went on a Brunei river cruise led by a family of committed wildlife enthusiasts. Dad (Mark) captained our boat, with his son at the helm of a second vessel. 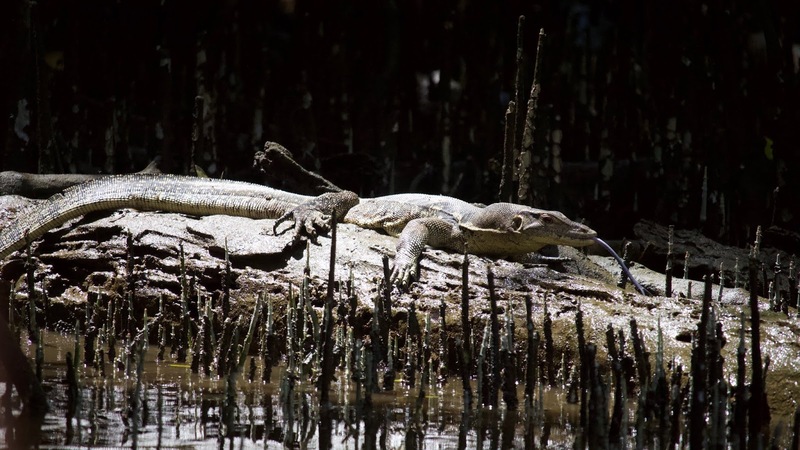 Mum (Wan) provided commentary from Dad’s boat and stayed on board with us throughout, while her husband wedged the boat in a nest of branches and nimbly alighted, climbing perilously into the mangroves with his DSLR and camouflaged telephoto lens, to take unparalleled photographs of proboscis monkeys (with and without infants), monitor lizards, sea eagles, night herons, greenshanks, barn swallows, fairy terns, crocodiles and more. I got some fairly decent photographs on my DSLR, which provided a great way of identifying distant wildlife and taking nice record shots, but Mark’s photographs were outstanding - exhibition quality. Given that I had been fairly impressed by the roadside wildlife simply on the coach on the way in from the airport, I was in awe of the variety of species that we had seen on the river cruise. However, the river cruise was not solely about wildlife. We travelled on the two intertwining rivers (the Sungai Damuan and the Brunei River) and we saw the Istana Nurul Iman, the official residence of the Sultan of Brunei which holds the Guinness World Record for the world's largest residential palace (by floorspace). 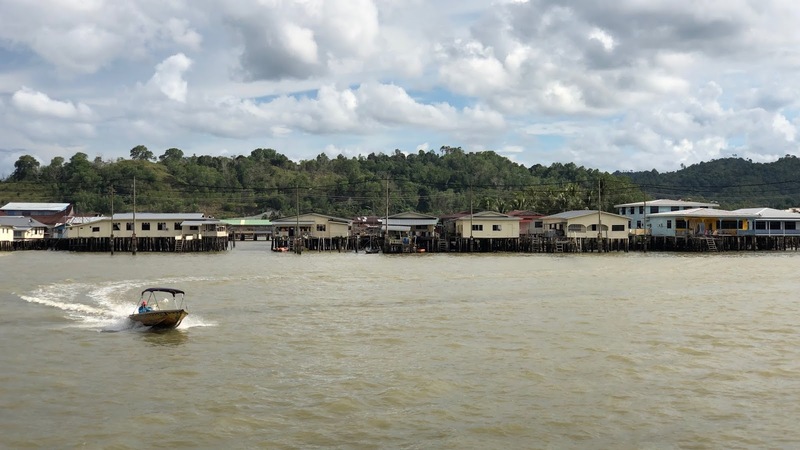 We were also shown around Brunei’s fascinating historical water village, a community of several hundred buildings on stilts over the river. Mark, Wan and family pointed out their home and their children’s school. They explained how clean water is supplied to them and generally how day-to-day life takes place here. Before finishing the cruise we were able to see the new (enormous) cable-stayed Sungai Kebun Bridge, which opened in October 2017. 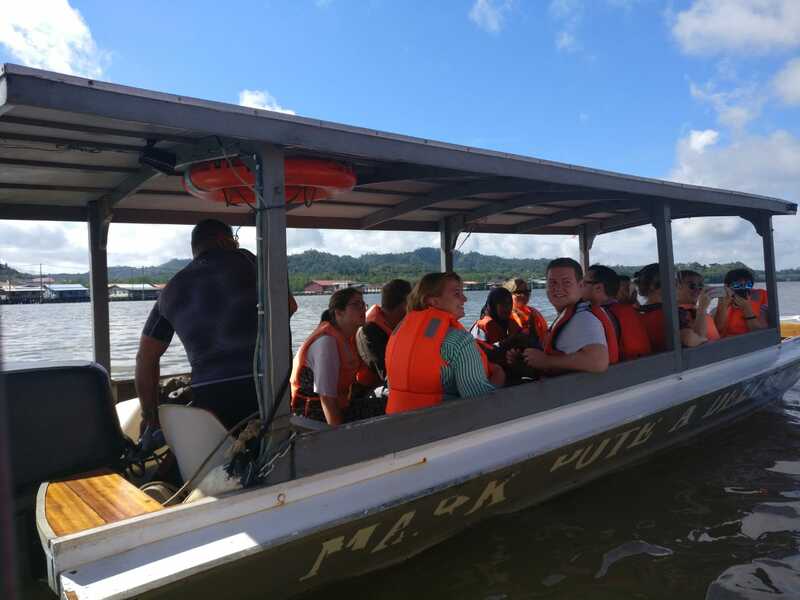 Travelling and exploring by boat was fantastic and the cruise made me feel like the tour had really begun in earnest - we were undeniably, gloriously, in Asia. The kind family transported our river tour groups back via a small tributary (the Kianggeh River) which returned us as close as possible to our hotel. After a group photo opportunity, we thanked our river tour guides and many of us went to explore the Kianggeh market. There were monkeys all around, squabbling over scraps and chasing one another. Though it was fairly subdued in relation to some of the other markets we would visit later, it had all the aromas you would expect from an Asian market. I got the impression that it was winding down in preparation to close but I wandered around in fascination wondering what many of these ingredients would be used for. There were so many things I had never seen before - and I had previously thought I knew a fair amount about Asian cooking. Clearly, I had much to learn. Day markets were one thing but the night markets were something else. One evening eight of us went in two taxis to the Gadong Night Market. As we approached, the rising charcoal smoke was illuminated by florescent tube lights all along the ceiling, above the hubbub of this covered but open-sided market. A melange of cooking smells masked the individual smell of each stall, which I found slightly unnerving. After my first lap of the market I was still unprepared to choose anything to eat. 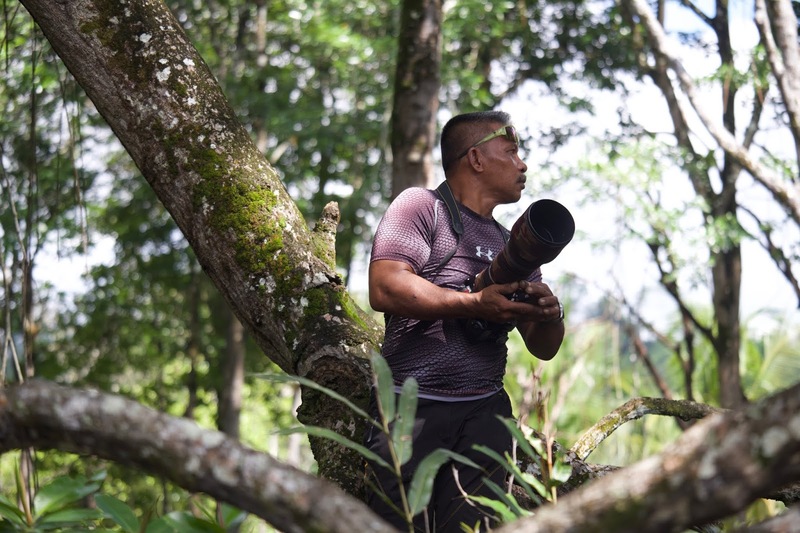 On lap two I began to mellow, singling out things I would consider, and eventually - on lap three - I exchanged five or six Brunei Dollars for a freshly-made curry dish with rice, which I brought to the table to share with a few in our group. Lap four saw a brave but rewarding venture and after a prolonged inquisition with the chefs about which type to choose, we brought a marinaded and chargrilled whole river fish back to the table. We picked at this barbecued centrepiece with our fingers until there was nothing left, and we felt both courageous and contented with our choice. At the time, the market felt like bedlam compared to our expectations at home, but compared to what we would witness later in the tour it was orderly and fairly serene. While we were at the night market we experienced another extreme downpour, which was amplified over the large area of the market’s corrugated metal roof. By Saturday 20th October 2018, we’d had a few days to adjust to the timezone and it was now time to make some music. The performance was held in the Arts Centre at the Jerudong International School and was attended by members of Brunei’s Royal Family. The day began with a procedural briefing and a dress rehearsal. After the rehearsal the first educational project of the tour began; Toyota’s ‘Start Your Impossible’ initiative educates, inspires and encourages people to reach their full potential. Steven Devine (director), Daniel Edgar (lead violin), Geoff Coates (first oboe), Robert Percival (first bassoon), Russell Gilmour (first trumpet) and Richard Bayliss (first horn) presented an educational event to a group of students from the Jerudong International School. There was a varied age range and students showed great interest, asking us excellent questions. I assembled a makeshift unwound natural trumpet and I asked some of the younger students to hold the various tubes of the assembly. They were able to see and hear the instrument getting longer as lengths of tubing were added to it. Those assisting me in holding the trumpet together were able to feel the vibrations passing through the brass. It was an enjoyable and successful education event and I also had the pleasure of meeting one of the brass teachers from the school who had been in attendance. He was very excited about hearing and seeing a natural trumpet and it was great to let him try it for the first time, playing my instrument. 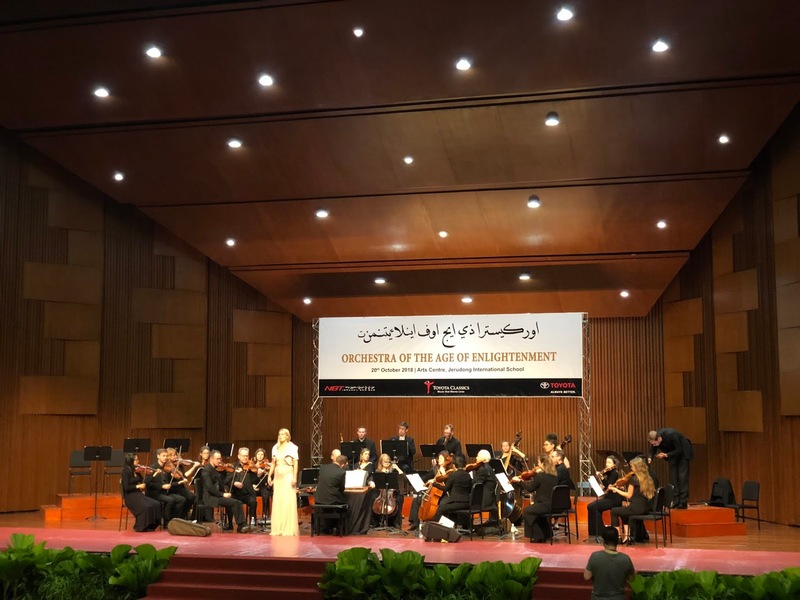 The performance began at 20:30 with the arrival of the royal party, during which the Orchestra of the Age of Enlightenment played the Brunei National Anthem. Will Russell (second trumpet) and I were playing from a small, stage-left riser and the two horns were playing from the equivalent stage-right. The horn and trumpet sections had decided to play the first piece in the programme, the Suite in D major from Handel’s Water Music [HWV 349], standing up. We removed our own chairs before the beginning of the concert to create more room on the raised platforms. The performance began with votes of thanks and cheque presentations - we then realised why the chairs had been put there for us! Several local pieces of music had been arranged specially for the Orchestra of the Age of Enlightenment to play in this concert. There were two trumpets in Balik Kampung by Suidman and also two trumpets in Apa Khabar Orang Kampung - undoubtedly one of the catchiest tunes I have ever heard. These were very well received by the audience in Brunei. After the concert, we attended a reception at the Royal Brunei Yacht Club - one of the few places where alcohol can be served in Brunei. The coaches had some trouble getting there as one of the nearest roads had a newly-imposed height limit barrier. Eventually another route was found and we got to the reception and enjoyed the excellent food, drinks and musical entertainment with a few of our own throwing their hats into the ring! The following morning, we returned to Brunei International Airport for our flight to Bangkok Suvarnabhumi Airport. 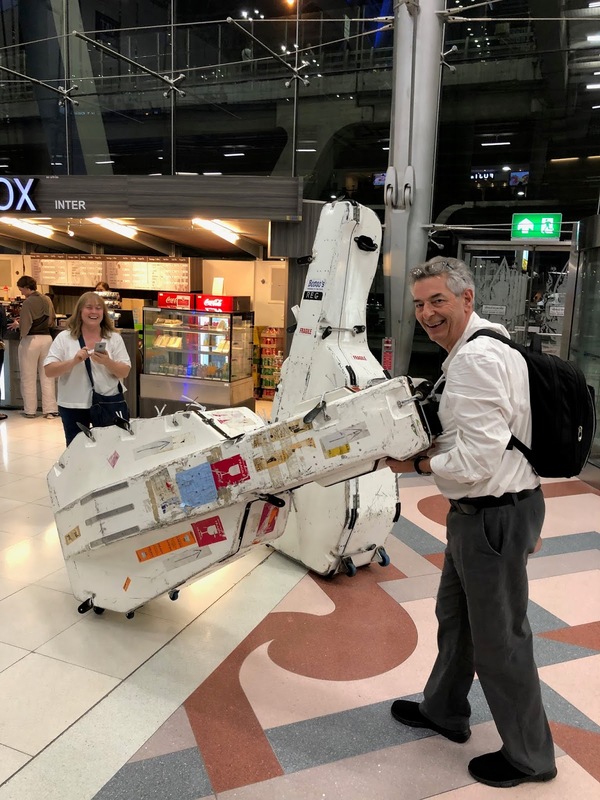 Before this tour, most of us would have looked at the airport departure screens to find out where to go; during this tour it was typically easier to use the double bass flight cases as beacons for the check-in desks.